Communities around the United States seeking federal housing grants will soon be required to grapple with segregation and inequality in housing under new federal rules announced Wednesday. Home Prices Continue to Rise, But For How Long? Home prices climbed 6.3% in May, marking the 39th consecutive month of year-over-year gains, according to a report by CoreLogic. Prices in 10 states, including New York and Texas, plus Washington DC, hit 40-year highs. In early June, Consumer Financial Protection Bureau Director Richard Cordray issued a decision in the first appeal of an agency administrative enforcement proceeding, and a deeper look shows how the bureau will proceed with such actions. Many borrowers are unaware of their homebuying power and are underestimating their mortgage eligibility, according to a recent study by Genworth Mortgage Insurance, a unit of Genworth Financial, Inc. The U.S. Department of Agriculture’s Rural Housing Service is raising the cost of its home-loan guarantees that enable borrowers to purchase homes in certain areas without down payments. Pending home sales continued to make gains last month, rising to the highest level since April 2006, according to the National Association of REALTORS®' Pending Home Sales Index, a forward-looking indicator based on contract signings. Yesterday’s abrupt surprise announcement by the Consumer Financial Protection Bureau (CFPB) that it will be issuing a proposed amendment to delay the effective date of the TILA RESPA Integrated Disclosure (TRID) rule, until Oct. 1 was greeted with calls from across the industry that challenged the Bureau to go further to help accommodate consumers and lenders. Tech provider Pavaso announced a new solution that promises to help business implement digital closing and ensure compliance for the coming TILA-RESPA regulations. The Interthinx (FAF) National Mortgage Fraud Risk Index rose 3% in the fourth quarter of 2014, rising to a reading of 101. Mortgage rates were pushed up slightly by mixed economic reports, according to the latest data released by Freddie Mac. FHA announced yesterday that it extended the effective date for the policies contained within its new Single-Family Housing Policy Handbook from June 15 to September 14. Freddie Mac (OTCQB: FMCC) today released its updated Multi-Indicator Market Index® (MiMi®) showing the U.S. housing market continuing to stabilize and getting back on track heading into the spring homebuying season after a slight stumble last month. The latest release of MiMi now tracks the top 100 metro housing markets across the country. Of the top 100 metro areas, 60 percent are showing an improving three-month trend. Former home owners who lost their home to a foreclosure or a short sale are re-entering the housing market. Some housing analysts believe they could provide a big boost in housing demand for years to come. The Consumer Financial Protection Bureau issued guidance on how to provide mortgage applicants with a list of local home ownership counseling organizations. The new guidelines, which overwrite ones originally issued in 2013, offer guidance to lenders on how to provide applicants abroad with home ownership counseling lists; permissible geolocation tools; disclosures; and high-cost mortgage counseling qualifications. One measure, approved 401-1, would direct the Consumer Financial Protection Bureau (CFPB) to establish a two-year program to allow individuals to apply for rural area designations for purposes of eligibility for qualified mortgages. Currently, the CFPB uses rural designations established by the Department of Agriculture. Mortgage applications for new home purchases increased by 17% relative to the previous month, the March Mortgage Bankers Association's Builder Application Survey said. According to the Q1 2015 Spark Business Barometer from Capital One, 55 percent of small business owners are very confident they are taking advantage of small business tax deductions, but what about the other 45 percent? National home prices in February were up, year-over-year, for the third consecutive year, according to the latest Home Price Index report by CoreLogic, released Tuesday. The pace of Federal Reserve interest rate hikes will largely depend on financial markets' response to the increases, New York Federal Reserve president William Dudley said Monday. On March 30, the Consumer Financial Protection Bureau published a revised consumer publication related to mortgage loans. 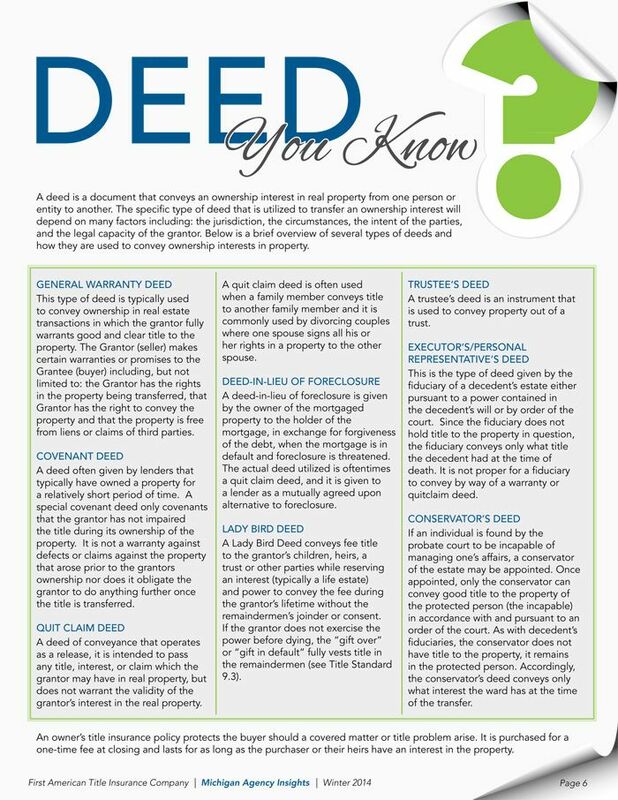 This publication, a replacement of the "Settlement Cost Booklet" or "Special Information Booklet," is a widely anticipated companion to the Truth in Lending Act and Real Estate Settlement Procedures Act, or TILA-RESPA, Integrated Disclosure (collectively referred to as TRID) requirements. The 30-year fixed-rate average inched up to 3.7 percent with an average 0.6 point. (Points are fees paid to a lender equal to 1 percent of the loan amount.) It was 3.69 percent a week ago and 4.41 percent a year ago. Industry experts say emerging housing markets are positioned to compete with major markets such as New York, Boston and Washington in 2015. With lower costs of living and better-than-average employment opportunities, these up-and-coming cities may be just the place to call home. The U.S. economy added a disappointing 126,000 jobs last month, the weakest growth in more than a year and a sign that the labor market is finally being tripped up by a broader economic slowdown. Proactive title agents are preparing today for eClosings. One title group in Utah said the prep work for its first eClosing transaction was more involved than with paper closings, but was worth the effort. As regulations have increased around the title industry, the attention paid to compliance and implementation has grown as well. In the second of our two-part story, we look at how the compliance work can benefit companies as Aug. 1, 2015, approaches. Slightly lower interest rates and home prices in markets across the country contributed to a slight increase in nationwide housing affordability in the fourth quarter of 2014, according to the National Association of Home Builders/Wells Fargo Housing Opportunity Index (HOI) released today. It's getting more expensive to buy a house. Prices rose 6% in the fourth quarter of 2014 as buyers competed for fewer and fewer available homes for sale, according to new data from the National Association of Realtors®. WASHINGTON (AP) — Average long-term U.S. mortgage rates rose this week yet remained near historically low levels. (Reuters) - Applications for U.S. home mortgages fell last week as interest rates rose, an industry group said on Wednesday. Spring is traditionally considered the best season to list a home, but it doesn't inch out the other seasons by much, according to a new analysis by the real estate brokerage Redfin. The interest rate for a 30-year, fixed-rate mortgage rose last week, riding a wave of positive economic data according to a new report from Zillow. A U.S. housing regulator is considering limiting one of the most powerful tools federal attorneys have to punish banks for making mistakes in mortgage lending, a move the Federal Housing Administration hopes will encourage banks to give more home loans to worthy but weaker borrowers, according to people familiar with the matter. (Reuters) - Applications for U.S. home mortgages rose last week as interest rates fell, an industry group said on Wednesday. Refinance applications revived toward the end of 2014 and into the new year as mortgage rates dropped back down to levels not seen since 2013. U.S. Rep. Bill Huizenga, R-Mich., reintroduced to the new Congress the "Mortgage Choice Act" – a bipartisan piece of legislation that would amend and clarify the qualified mortgage definition in the Dodd-Frank Act thereby improving access to credit and qualified mortgages for low and moderate income borrowers while protecting consumers from bad loans. WASHINGTON — When the federal government's consumer protection agency for financial matters tells you how to shop for a good deal on a home mortgage, you should follow the advice, right? WASHINGTON - Wells Fargo and JPMorgan Chase could face more than $35 million in penalties and restitution for allegedly receiving data on consumers and other services in return for directing customers to a Maryland-based title company. WASHINGTON — The job market is stirring, gas prices are plunging and stocks are near record levels, but a housing sector that dragged the nation into the worst recession since the Depression remains the black spot in an otherwise resurgent economy. Six years ago, homebuilders and Realtors were facing brutal business conditions: millions of Americans were losing their jobs and homes. As 2015 begins, hiring is strong and economic indicators are pointing up. Could this be the year when the housing market finally breaks out of its tepid recovery and takes off? The past year was filled with record-low interest rates, steadily rising home prices and loosening mortgage-lending standard, making it one of the strongest years in the housing industry since the financial crisis six years ago. The U.S. housing market failed to provide the lift to the economy over the past year that many analysts expected. It enters a new year with few signs pointing to either a renewed breakout or a sharp slowdown. The New Year is upon us. This means that the time for preparing your 2014 tax return draws near. Soon you’ll don your tinted visor, dust off your ten-key, and get to work filling in your Form 1040. The interest rate for a 30-year, fixed-rate mortgage fell last week, continuing a trend of sub-4% interest rates, according to a new report from Zillow. The aging of the Baby Boom generation combined with the flood of capital into commercial real estate is driving up the costs of properties that cater to senior living. Consumer sentiment held steady the last two weeks at a very high level of 93.6, little changed from 93.8 at mid-month and far above November's final reading of 88.8. It’s been an odd year for the housing market. It kicked off with the ‘Polar Vortex,’ blamed for slowing home sales in the early part of the year. As 2014 draws to a close, the National Association of Realtors expects sales of previously owned homes to fall short of 2013’s total, while the latest monthly data on new homes show sales were up just 1.8% in October from a year earlier. Nov. existing home sales slow across U.S. Sales of existing homes fell all over the U.S. in November, sliding 6.1% to the slowest annual pace since May, the National Association of Realtors said Monday. Even though prices are way down, oil can’t catch a break from homeowners who remain willing to spend thousands of dollars converting their heating systems to natural gas.